Zhang Yimou rose to international prominence in the early 1990s with a series of films depicting a woman (always starring his partner, Gong Li) struggling to make her way in an indifferent society. But Zhang’s thematic and stylistic range has always been relatively broad, and over the years he has demonstrated his skills across a wide spectrum of film genres. In fact after the Gong Li films, he ventured into films noir (Shanghai Triad, 1995), black comedies (Keep Cool, 1997), and Hong-Kong-style martial arts features (Hero, 2002). It almost seemed as if with each new outing he had set out to demonstrate his prowess with a new genre. But Zhang is more than a professional artisan adapting his style in accordance with his latest assignment: with each new film he seems to be exploring the boundaries of whatever genre engaged. So it was with his fascinating and wistful Happy Times (Xìngfú Shíguõāng, 2000). Social Commentary – a theme that, of necessity, can only be implicit in Chinese-made films. With respect to this thread of the film, there is a subtle interplay and contrast throughout between literal honesty and sincerity. Existential Struggle – the artistic theme that has characterized and distinguished Zhang’s greatest work. Reviewers have frequently seized upon one of those stylistic themes above, to the critical neglect of the other two, which helps account for the wide variation of opinions on the film. The story goes through four phases, although the third section could be divided in two to make five overall phases. As it progresses, it moves gradually from mostly lowbrow-comedy (LC) mode more to one of social commentary (SC) and existential struggle (ES). 1. The Happy Times Hut (22 minutes). The film opens in lowbrow-comedy mode with Zhao, a fiftyish bachelor, trying for the 19th time to find a woman who will marry him. The object of his ardent pursuits on this oc casion is an obese, twice-divorced lady whom he has found through a matchmaker. This woman (who is nameless and only referenced occasionally by Zhao’s mates as the “Chunky Momma”) has two children: a super-spoiled and equally obese teenage son, who is a repellent icon of China’s one-child policy, and a blind, eighteen-year-old step-daughter, Wu Ying, whom she treats abusively. It soon becomes evident that Zhao is a schemer who “talks out of both sides of his mouth” and is perpetually short of cash. One of the reasons for his financial straits is that he and his mates are all “retired”, i.e. part of China’s vast body of elderly workers who have been laid-off from uncompetitive state-own companies. Throughout the film the theme of misrepresentation to keep up appearances is presented on many levels. But underlying this theme is a distinction between literal truth and authenticity of feeling. Although broke, Zhao promises his intended wife that he will fund a relatively posh 50,000-yuan wedding for her. This big-shot posturing presents his first (of many) problems: how is he going to come up with the cash for such a wedding? 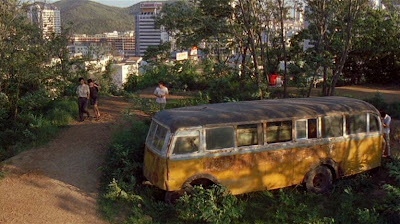 His friend and former workmate, Fu, helps out by coming up with a scheme to refurbish an abandoned bus in back of their old, shutdown factory and charge lovers searching for a private tryst location. The two schemers label their rendezvous site, the “Happy Times Hut”, and soon Zhao is boasting to Chunky Momma that he is a big-time hotel manager. Zhao’s problem looks like it may be solved. The Chunky Momma, eager to get her blind step-daughter, Wu Ying, out of her flat, insists that Zhao get her a job at his hotel and have her quartered there. This presents another problem for Zhao, and the narrative now shifts from primarily lowbrow comedy (LC) to incorporate Wu Ying’s existential plight (ES ). Zhao agrees to the demand to give the girl some kind of make-work, and conducts a fake job interview, during which Wu Ying reveals her sad history of how she lost her sight and then her father. 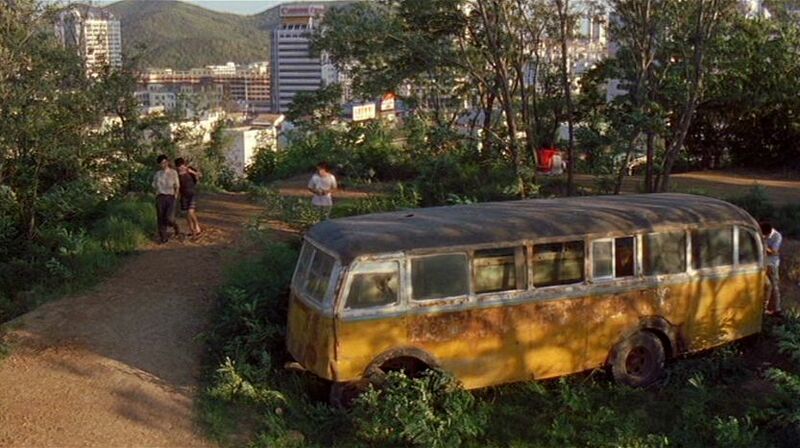 But when Zhao leads the girl to his “Happy Times Hut” bus for her first day on the job, he finds that the old abandoned bus has been removed as an eyesore by the landowner. His “business” is kaput. So now Zhao’s new, immediate problem, besides that of making money for the wedding, is how to find shelter for Wu Ying so that she doesn’t give away the truth about his phoney background. Having learned that Wu Ying knows how to give massages, Zhao and Fu get permission to temporarily refashion their shutdown factory workshop with the tools that remain there. With the help of their other “retired” workmates, they erect a fake hotel massage parlor for Wu Ying to be the masseuse. The workmates then pretend to be hotel customers, and Wu Ying happily gives them all expert massages. By this point Zhao and his mates are so concerned about Wu Ying’s happiness that they seem to have forgotten about the original problem: the needed 50,000 yuan. With no money coming in, Zhao even hocks his old TV in order to buy Wu Ying a new dress for her “job”, and the “customers” have to use fake money even to give the customary tips to their masseuse. But for the moment, the fantasy is intoxicating, and they all reinforce themselves with giddy optimism. While celebrating their supposedly booming massage business at a noodle shop, Wu Ying takes out a letter from her absent, beloved father that was written to the Chunky Momma and asks Zhao to read it to her. As Zhao reads it aloud and realizes that the letter only talks about the rascal father’s monetary failures, making no mention of Wu Ying, Zhao pauses and fibs that there is a hard-to-read postscript of the letter about Wu Ying that he will read to her later, when he has his glasses. On his next visit to the Chunky Momma, Zhao learns that he has been summarily dumped. The woman berates him for all his lies and admonishes him to “be honest and speak the truth”. He can only respond that though he did lie, his overall feelings for her were sincere. But she boots him from her premises, and the dejected Zhao is out on the street, consoling himself with alcohol. He borrows a pen at a canteen and adds some promised fake words about Wu Ying to her father’s letter, but a short while later he is run over by a truck. At the end of the film, Fu and the other workmates go to the hospital and find Zhao in a coma, and then, when they return to Zhao’s apartm ent, they learn that Wu Ying has run away. So at the conclusion of the story both Wu Ying and Zhao face uncertain and dubious futures – we don’t know if Zhao will regain consciousness, and we don’t know how Wu Ying can survive wandering sightlessly in the streets. Yet despite these dire circumstances for the two protagonists, the film ends on a curiously uplifting note. Both Zhao and Wu Ying have left messages to each other which cannot be delivered to their intended recipients and are known only to Zhao’s workmates. Zhao’s message is the fake letter to Wu Ying, and Wu Ying’s message is a tape recording to Zhao that she left in Zhao’s apartment just before departing. Each message urges its recipient to believe in her or himself and always to have faith in a positive outcome, no matter what difficulties life may present to them. Each of the two final messages basically asserts the same thing: that life can be beautiful if you don’t give up – and that authentic, sincere, and meaningful interactions with other people are ultimately possible and worth striving for, no matter that some of them may turn out sour. At the end of the film, what started out as a colloquial comedy has turned into a soulful and inspirational message of hope. Looking back over the course of the narrative, we could say that by engaging in sincere, authentic interactions with each other, Zhao and Wu Ying gave each other something priceless. And yet during their all interactions, each of them was participating in an extended deception, a pack of lies. But underneath those lies was an authentic concern for the other. Wu Ying’s recording recognizes Zhao’s ultimate sincerity by acknowledging that “even though the money was fake, your intentions were genuine”.